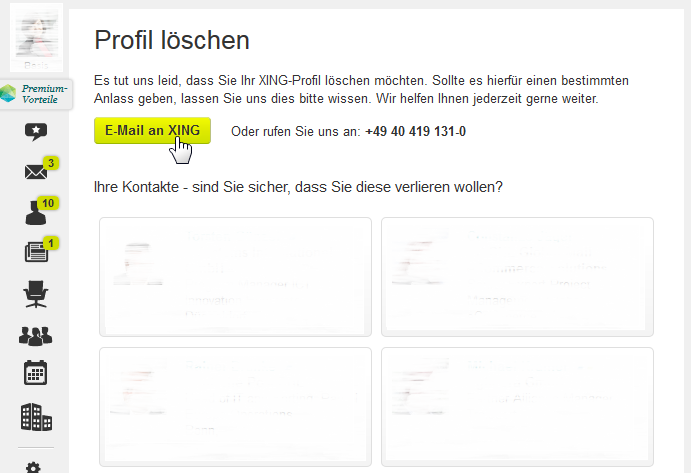 If you thought getting out of your gym contract in Germany was hard, try deleting your XING profile. For those unfamiliar with the platform, it is a German language version of LinkedIn. Not only is it completely useless, it is hard to use and even harder to get out of. I had been trying for months to opt out of this platform, but they purposefully make the leaving part so hard that you’re likely to give up after not finding your way around. I reached the breaking point when I discovered that a crappy ‘people’ search engine called Yatedo was pulling my personal data out of XING, a supposedly registered platform for members only, and displaying my work and education details for all the world to see. I decided to seek the help of a German native speaker to help me navigate the murky world of XING and rescue my identity from these thieves, as I was sure that it was my German and not their business ethics that was to be blamed for the confusion. What we discovered is completely straight-forward. How dare I accuse an upstanding, job-creating and tax-paying company like XING of malicious business practices? 1) Select the entirely obvious and very prominent “Hilfe & Kontakt” link on the top-right. Notice how it is helpfully colored in gray, so as to not strain the eyes of XING’s poor customers too much. 2) Enter “löschen” into the Search field under the Help area. 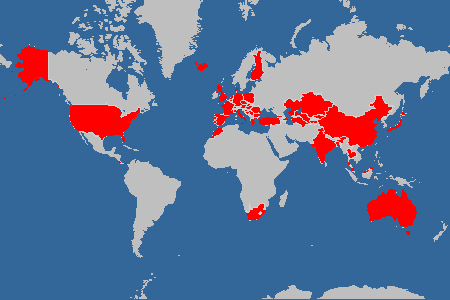 Notice how it provides a long list of helpful links. 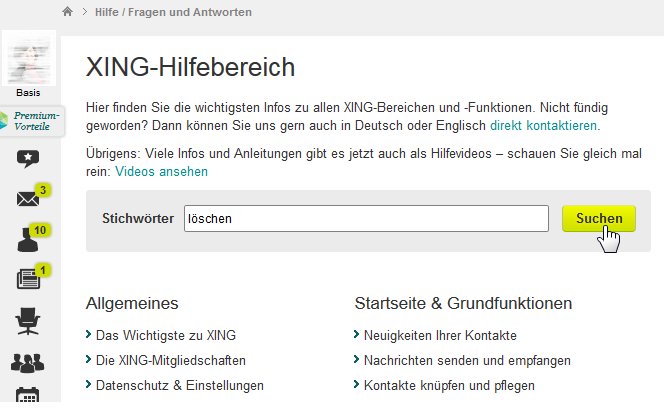 XING knows that the last thing you would want to do is remove your account, which is why they did not include a link that would quickly get you to that function. 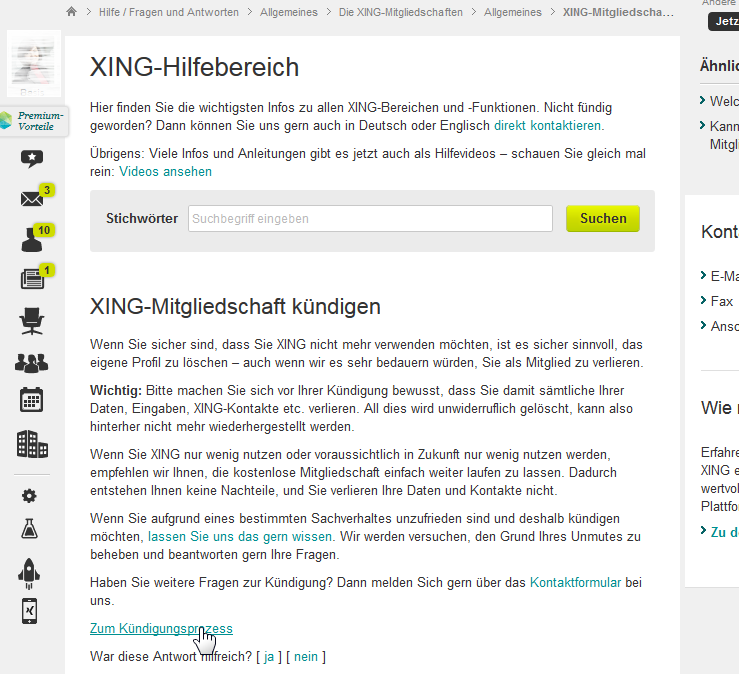 2 ½) Click on the link “XING-Mitgliedschaft kündigen”. XING is obviously not doing all they can here; please excuse its lapse in judgement for not making this link the last one in the list of search results. 2 ¾) Since XING probably had too many angry customers who, after the previous steps, accidentally clicked on the button to cancel their account, they had to make the link a bit less obvious and have it look similar to six other links on the same page. The team behind XING still suspects that even those who continue to click it are doing so accidentally and therefore have initiated a task-force to find out how they can make its valued customers realize the error of their ways. 2.99999999) Most of the complaints received were probably from customers who went through steps 1 – 2 ¾ because they did not understand the difference between composing an e-mail to the XING team and cancelling their account. 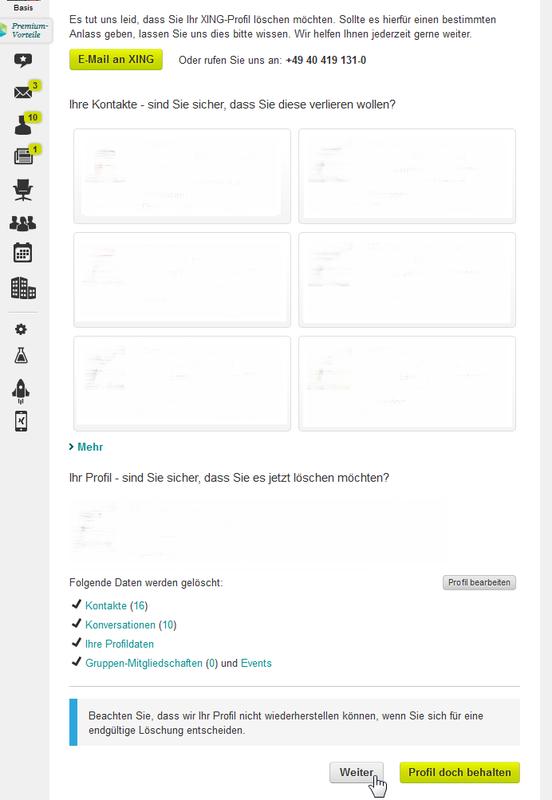 Therefore XING has implemented a huge button on the top of the page in order to send the team an e-mail. Because really, they’re just here to help you, no? They’ve also helpfully added their phone number. They would love to hear from you! Almost 3) They’ve added another couple of random buttons. So in the unlikely event that you ignore the nice button up-top and actually scroll down, you still have a choice. They really, really wouldn’t want you to feel that they were forcing you to do anything. Especially anything rash and unconsidered. Like, don’t you want to sit down, have a tea and talk to them first? Notice the toned-down button, which they’ve located in the same place where you’re likely to find the ‘Cancel’ button. XING is particularly proud of that one. Most definitely almost 3) Yes. Hit “Profil löschen”.